If you follow me on Insta (if you don't, pls do now, I'd appreciate it v much – @sophiespaldin), you may know I have a new car. It's a Mini and essentially, it's the same car I had in 2015, I've just bought it again in a different colour (my last one was red). Most mini owners re-purchase... they're a good car! Anyway, I swear this is not a sponsored post. Primarily, I wanted to discuss the fact that I hadn't driven for THREE YEARS and was bloody terrified to get behind the wheel again. So much so that over the last year in Australia I chose to forgo doing so at all costs (well, bar the time I gave the automatic we rented for the Great Ocean Road a go in an empty car park for the lols, and believe me – there were lols. My brain just couldn't accept the brake was not the clutch). So after a year of avoiding driving rental cars, Barbie cars and 4WD's, I discovered driving literally is like riding a bike. Ppl were not wrong. I think it helped that I'd driven a mini before, but still, if you haven't driven in a while, or are getting a new car, or passed your test yonks ago and are scared to drive, don't be. The main things to remember are the rules of the road, I had a millisecond freak out at a junction when I just couldn't remember if I was supposed to chill in the centre for a bit while turning right. Oh and I gotta add I'm very on edge when parking as I have extremely little spacial awareness, but this was the case when I drove every day for five years so that ain't gonna change, I'm always going to be perpetuating the female stereotype in this instance soz gals. Anyway, moving on to less bank-busting purchases, how beaut is this Topshop chain bag?! I've been using my little round, straw bag featured below and in this blog post (it's the one EVERYONE in Bali, and a lot of other people globally, had in 2018), for evening, or any occasion that warranted a small bag, however, moving into Autumn and AW18 styling, I felt a refresh was required and when I saw this beauty I knew it was the one. 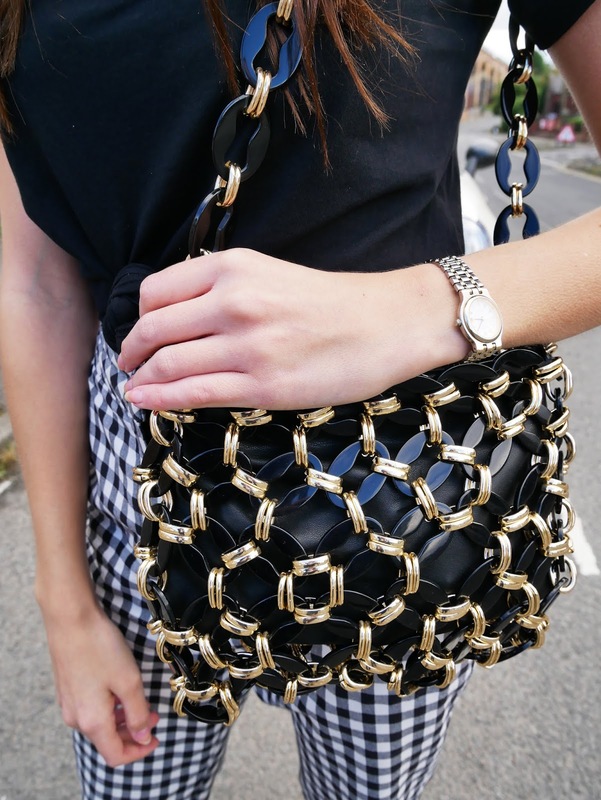 Chain bags and any with metal or plastic detailing on are huuuge this season so it ticks off a major trend, as well and generally being eye-catching and a great accessory to jazz up any outfit day or night.